All characters’ experience value, SP, skill level experience gained increases by 100%. Effect stacks for similar items. Additional content can be viewed in the Item section of the inventory in the menu. Damage dealt to enemies is doubled. Additional content can be viewed in the Item section of the inventory in the menu. All characters’ experience value gained increases by 200%. Effect stacks for similar items. Additional content can be viewed in the Item section of the inventory in the menu. All characters’ skill level experience gained increases by 200%. Effect stacks for similar items. Additional content can be viewed in the Item section of the inventory in the menu. All characters’ SP gained increases by 200%. Effect stacks for similar items. Additional content can be viewed in the Item section of the inventory in the menu. Glasses Set B: Silver Frame Monocle, Black and Red Half Frames. An extremely classy monocle with chic silver frames. Square-framed glasses with open tops that make you look smart. You can buy it at any time in the game shop (Fashion Store in Castle St.) when you purchase it. Complete animated jigsaw puzzles alone or team up with friends to finish them together. Animated Jigsaws – Beautiful Japanese Scenery contains moving images capturing the natural beauty of Japan from all four seasons. Piece together scenes from some of Japan’s most famous places. Feel the thrill of horror mixed with a dose of humour, beauty, ugliness, and weirdness in the surreal world of Earthworms – brought to Nintendo Switch especially for you to delve into! Play as Daniel White, a private detective endowed with parapsychic abilities, and solve investigations with the help of his visions. Explore an enthralling forest island, learn magical songs and interact with the local wildlife to solve environmental puzzles. Toki Tori 2+’s ingenious game design requires just two moves: whistle and stomp. It’s super accessible, yet it builds up to incredible complexity later on. Crossed Swords is an action game released by SNK in 1991. In order to defeat the demon Nausizz, use Weapon Attacks, Magic Attacks, and your Defend ability as you make your way through seven intense stages. You control a mysterious girl who arrives at a city that is completely flooded with water. Only she possesses the ability to control light. By using the girl’s supernatural power, you can solve various puzzles to gradually make the water recede and ultimately save the city. 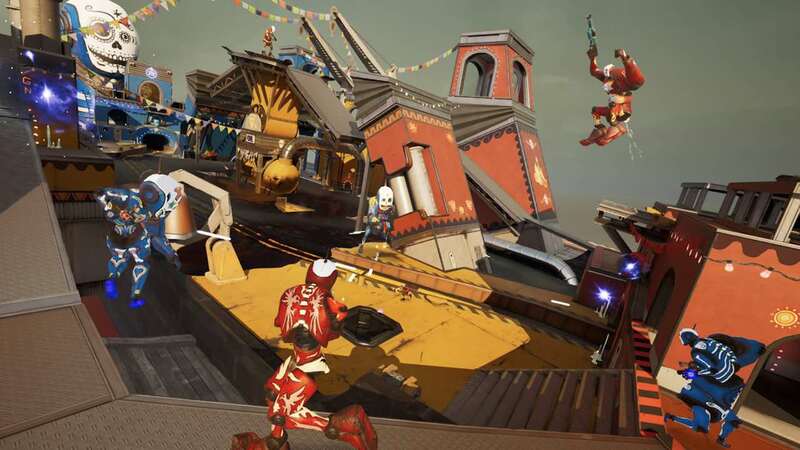 Morphies Law is a 3rd person 3D shooter where you can steal mass from other players making them shrink while you grow, which balances the game. Size affects everything! what you can do, how you can navigate the different maps, how to play each game mode and more. Nekopara, a famous PC adventure game, is out for Nintendo Switch. Minaduki Kashou leaves a family-run traditional Japanese sweets shop to open his own cake shop, “Le Soleil”. With human look-alike Nekos, Chocola and Vanilla. Shio is a challenging platformer game in which you jump from lantern to lantern. If you like to challenge yourself, you will like Shio as well! The aim of the game is to chase down a giant space beast and race to enter the creature’s mouth as it spews out a series of different psychedelic racetracks. Modify your junked up classic car and compete to become the intergalactic winner. The Low Road is a point-and-click graphic adventure game in which rookie agent Noomi Kovacs must navigate her way through the world of corporate espionage in this dark spy comedy set in the 1970s. Sporting a unique visual style inspired by gouache paintings and a pulsating rock and roll score, The Low Road will captivate players through intricate puzzles, branching moral dilemmas, and a quirky cast of memorable characters. The walk home from school today is going to be a lot spookier than usual… Your sleepy neighbourhood’s been overrun by monsters! You’ll need to use your wits to investigate the surroundings, puzzle out clues, and outsmart the monsters before it’s too late! Help the Robo Chicken get the stolen light bulbs back! Get to the end of each level in the shortest amount of time possible and try to collect all the gizmos along the way. Beware the hungry Roaches, pesky Flies, shooting cannons and other deadly obstacles. This is complete edition consisting of the Base Game and the “New Power” DLC. Realpolitiks is a streamlined real-time grand strategy game that allows you to become the leader of any contemporary nation. Dive deep into the issues of the modern world, with its current geopolitical borders, using your country’s power and economic strength to engage in military conflicts and international affairs. Best friends Arina and Frendt fall into a series of vibrant, dreamlike island gardens peppered with everyday objects from their childhood. Manipulate time to solve puzzles and reach the apex of each isle. Follow the duo as they unpack and explore their significant moments spent together, lighting up constellations and illuminating threads of a bittersweet narrative. As a demon army besieges his village, a young ninja ventures through a cursed world, to deliver a scroll paramount to his clan’s survival. What begins as a classic action platformer soon unravels into an expansive time-travelling adventure full of thrills, surprises, and humour. Western 1849 Reloaded is a captivating Arcade Shooter, that will take you through the ultimate gunfights across various locations of the Wild West. This application allows you to transfer your save data from the Nintendo 3DS title Monster Hunter Generations to the Nintendo Switch title Monster Hunter Generations Ultimate. Note: a copy of each of the aforementioned titles is required to perform save data transfer. For details on what data is transferred, please visit the official website.